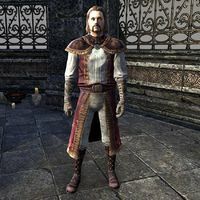 Duke Sebastien is a Breton and the exiled leader of the city of Camlorn. "You don't look like a Bloodthorn cultist. I assume this is a rescue attempt?" Yes, I'm here to rescue you. "Divines be praised. The cultists trapped me with these focus crystals. I'm a bit of a mage myself, but I'm powerless inside this ward." "Destroy the focus crystals! I can't move while this binding spell holds me." "Thanks, friend. But I'm not the cult's only prisoner." Who else did they kidnap? "I overheard the cultists talking. They have a prisoner who's a threat to the werewolf leader, Faolchu. They plan to execute her. If she really is a threat, then it seems crucial that we rescue her." I'll find her and set her free. "Very good. I'll return to Aldcroft. Meet me there after you rescue this mysterious woman." "Here I am, safe and sound back in Aldcroft. I have you to thank for that." Have you spoken to Gloria? "Yes, and I share her concerns about both Camlorn and Aldcroft. We must deal with these werewolves once and for all. In fact, I hope to involve you in that." "Gloria suspects Faolchu's agents are here among us, even now." "Indeed. They hide in human form. It's exactly what they did in Camlorn before they struck. We need to find and destroy them before Aldcroft suffers the same fate as poor Camlorn." How can I spot the hidden werewolves? "Gloria says this amulet can be used to reveal the hidden werewolves. I'm sure she can tell you more about it." If there are werewolves here, I'll find them. "Point the amulet at people in Aldcroft. It will reveal if someone is a werewolf or not. It pains me to say this, but pay special attention to the refugees from Camlorn. I don't believe they're all what they appear to be." This page was last modified on 20 February 2019, at 05:09.